There are dozens of recipes for delicious maple based edibles. I will be using this page to feature some of my favorite maple recipes. Beat together eggs, milk, maple syrup, salt, and spices. Pour over bread cubes. Allow mixture to completely soak the bread. Pour into buttered dish, pan, or ramekins. for about 45 minutes or until set. Cool. butter and cook until slightly thickened. Cool. 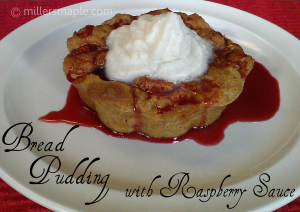 Serve pudding with raspberry sauce and garnish with whipped cream, if desired. This version of the classic chocolate chip cookie is our family’s favorite. We like the chewy and buttery texture. I love that there is no sugar added. Thoroughly combine butter, maple syrup, and egg. Add remaining ingredients and mix well. 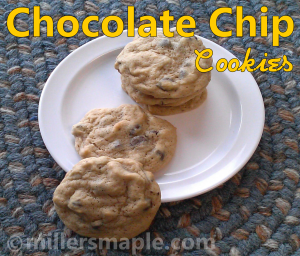 Drop by tablespoon onto ungreased cookie sheet. Bake at 350° for 10 minutes. Cool. Remove from baking sheet. Yield ~2 1/2 dozen cookies. This recipe can be doubled successfully. I add about 1/2 cup flour when doubling.